The Justice League Wonder Woman Trexi Mini-Figure! Features a sleek, round head, nifty movable limbs, and enhanced poseability with articulation! Justice League and Trexi join forces to bring you the Justice League Wonder Woman Trexi Mini-Figure! Featuring the iconic gold hue and red "WW" logo, the Wonder Woman Trexi measures 2 1/2-inches tall. 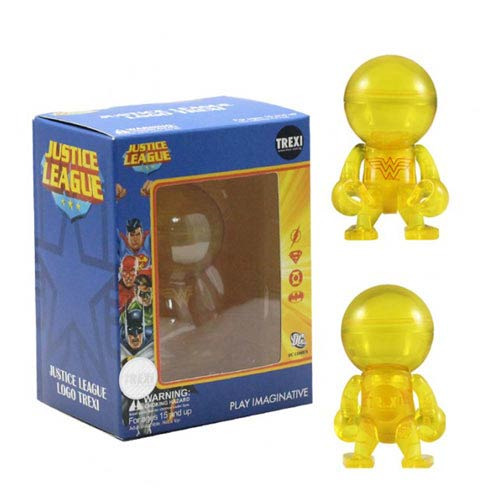 The Justice League Wonder Woman Trexi Mini-Figure features a sleek, round head, nifty movable limbs, and enhanced poseability with articulation. Ages 15 and up.